. they don't realize they're there! ", exclaimed Maghna as she paddled with Alan, Jeff and Jane toward the Lanai coastline.
. we were oblivious to at least two curious whales that were checking us out to see what kind of strange yellow creature this was with four fins, floating on the peaceful, almost still water.
. but they were moving TOWARD US and suddenly we felt extremely small and more than a little vulnerable. We started to paddle away, and they followed us! Then, we decided the best thing to do was to stop paddling and see where the whales were going. Finally noting that we weren't really something fun to play with after all, Mama and Baby whale casually turned and swam in the other direction, with a parting tail salute. We then continued on the 12-mile paddle to our fishing spot, an isolated beach of Lanai at a small bay far beyond the end of the road. Our odyssey across the channel on New Year's Eve began when a group of us decided we did not want to be on the island of Oahu at midnight, December 31. Knowing that hotels would be at a premium (if they were even available), we decided to go somewhere remote and do some fishing. From this emerged the plan to paddle from Lahaina, Maui across to the island of Lanai, fish for two nights, and then take the ferry back to Maui. Six of us flew to Maui on Dec 30 - Chuck and I, Maghna Zettle, Alan Calhoun, Jane Skanderup and Jeff Aurrecoechea. We picked up our boats from Young Brothers (barge service) with the help of Alan's brother Tom, and his wife Elaine. 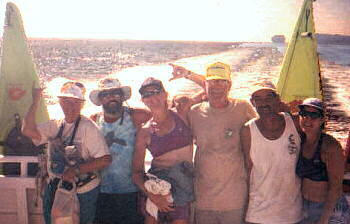 They also had a contact with a canoe hale in Lahaina, so we stayed there on a beach right near the Lahaina harbor. The sunset that evening was spectacular and boded well for a pleasant paddle the next day. and Chuck landed an aku - sashimi for New Year's!
. which, predictably, inspired some sexist remarks.
. from Kihei and Wailea on the right (east) all the way down to Kapalua on the left. The Lahaina and Kaanapali areas were aglow from 10 p.m. on. From our vantage point, we could enjoy the fireworks, but couldn't hear the noise and didn't smell the smoke. At midnight we toasted our good fortune, the Year 2000 and of course the sashimi . And, we danced with sparklers like no one was watching! New Year's Day arrived with the sun rising through the haze of firework smoke and hovering like a gorgeous giant orange pink ball over Haleakala. one alternative was to pack up and paddle another 10 miles to a new site on a rock beach, or stay where we were. After a grand and glorious New Year's brunch prepared by Chef Alan, complete with omelets and mimosas, there was little initiative to pack up and paddle! 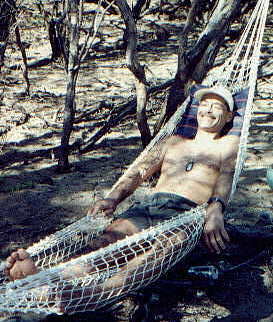 Instead, the day was spent shore fishing, shell gathering, a little hiking, some paddling, hammock sleeping and talking. Sunday morning, January 2, we packed up and paddled five miles around the corner to Manele Harbor. The shoreline begins its rise to cliffs, with superb diving and snorkeling spots all along the way. At the harbor we loaded kayaks and all our gear onto the Lahaina-Lanai Ferry, and enjoyed the ease of the one-hour crossing back to Lahaina. This time the whales were out in big numbers, putting on a show for us as we roared across the channel. Again, Alan's brother met us with the truck, boats were duly loaded, and we went off to "camp" our last night at the Maui Marriott. ("Re-entry" is always difficult and must be eased into with care.) Monday, January 3, we loaded boats back on the Young Brothers barge and the kayak millennium paddlers flew home.